(1) In a big bowl, mix together flour, sugar, baking powder, baking soda and salt. (2) Make a well in the bowl and add in the egg, yoghurt, oil, lemon juice and vanilla extract. (3) Stir the liquid mixture well before mixing in the flour mixture to just combine. (4) Line the muffin pan with muffin cups and fill half of the cups with the batter. 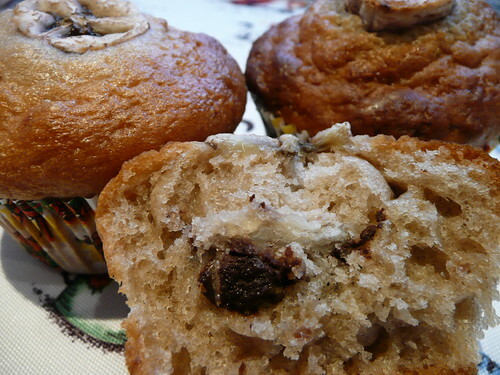 It is entirely up to the individual's creativity to add chocolate chips for chocolate filling muffins or crispy cereals to the batter for that added crunchiness or even a slice of banana to top the batter. (5) In a preheated oven of 180°C, bake for 15 minutes or until a skewer inserted in the center comes out clean. (+) A very easy recipe to assemble. (=) Yields extremely light, healthy and guilt-free muffins with it's one tablespoon oil batter!